Population: 10.3 million(July 2004 est.). Population growth rate: 0.11 % (2004 est.). Life expectancy at birth: 68.6 years. Religions: Eastern Orthodox 80%, other (including Roman Catholic, Protestant, Jewish, and Muslim) 20% (1997 est.). Ethnic groups: Belarusian 81.2%, Russian 11.4%, Polish, Ukrainian, and other 7.4%. Country name: Republic of Belarus (local: Respublika Byelarus). Government type: republic. Constitution: 30 March 1994; revised by national referendum of 24 November 1996 giving the presidency greatly expanded powers and became effective 27 November 1996. Independence: 25 August 1991 (from Soviet Union). Administrative divisions: 6 voblastsi (singular - voblasts') and one municipality (harady, singular - horad); Brestskaya (Brest), Homyel'skaya (Homyel'), Horad Minsk, Hrodzyenskaya (Hrodna), Mahilyowskaya (Mahilyow), Minskaya, Vitsyebskaya (Vitsyebsk). Terrain: generally flat and contains much marshland. Glacial scouring accounts for the flatness of Belarusian terrain and for its 11,000 lakes; the country is geologically well endowed with extensive deposits of granite, dolomitic limestone, marl, chalk, sand, gravel, and clay. Highest point: Dzyarzhynskaya Hara 346 m.
Climate: cold winters, cool and moist summers; transitional between continental and maritime. Main source: CIA - The World Factbook 2004. 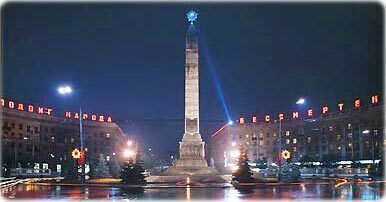 Victory Square, in Minsk, capital of Belarus. Founded in the 11th century, Minsk was almost completely destroyed during World War II. Today it is a new city with wide streets and large parks (photo Press Service - Belarus). After seven decades as a constituent republic of the USSR, Belarus attained its independence in 1991. It has retained closer political and economic ties to Russia than any of the other former Soviet republics. Belarus and Russia signed a treaty on a two-state union on 8 December 1999 envisioning greater political and economic integration. More: map of Belarus. 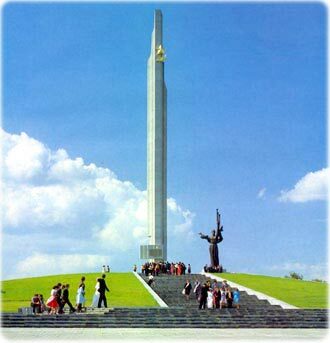 Monument in the Victory Park, Minsk, Belarus (photo Press Service - Belarus).